Spill red wine on the couch? No worries! If it’s upholstered with FibreGuard stain-resistant fabric, clean-up is as easy as water and a cloth. The same goes for wax crayons and ink, muddy pet paw prints and even vomit and urine, making it the perfect fabric for a family room. Don’t believe us? Watch these videos to see just how easy it is to clean. A red wine spill is no match for FibreGuard's stain resistant technology. See how easily it cleans up. Cats and dogs seem to take great pleasure in jumping on the furniture with muddy paws. FibreGuard’s stain resistance is woven into the fabric so it doesn’t diminish over time. Leaky pen? Or a toddler with Picasso talent who thinks the sofa is a canvas? Ink and crayon come clean in a jiffy. Just use water and a cloth. Watch the video to see how it’s done. 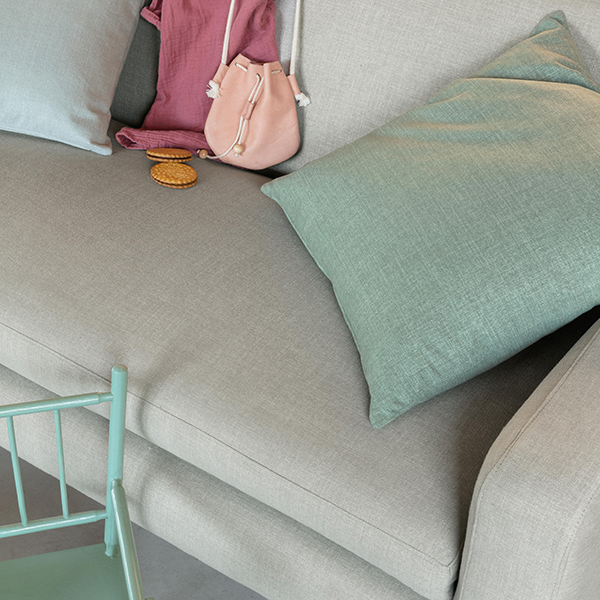 As stylish as they are stain resistant and low maintenance, the FibreGuard Casual and Leisure collections are available in a variety of colourways, from muted neutrals to bold jewel tones. Casual is 100% polyester and Leisure is a polycotton blend.